Get your carpets cleaned right now! We care about your enviroment hence we use eco friendly cleaning supplies. 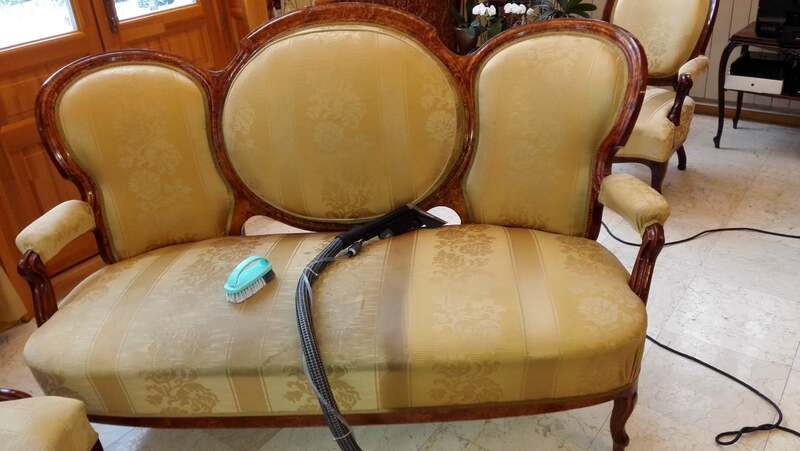 Upholstery cleaning Cork: Clean carpets for you and for your family. Don’t wait until it is too late! Order our carpet cleaning service today! WITH MORE THAN 20 YEARS OF UPHOLSTERY CLEANING EXPERIENCE! On demand, we can professionally clean your carpet or sofa in your home. We are very experienced in cleaning office carpets. We deal with any kind of carpet or upholstery surface that can be cleaned with our water-detergent method. More than 90% of textiles can be cleaned. We are very experienced in stain removal. We perform cleaning of fixed carpets with the latest technology and equipment. Removal of chewing gum is no problem! We can perform car carpet cleaning even on site. We can clean office chairs and bed mattresses as well – with powerful BIO certified material on request. We work throughout County Cork. For further information, please call: 0897064540. DRY CARPET CLEANING – WHAT DOES IT MEAN? Dry detergents can consist of synthetic polymers or organic absorbing materials that are rubberized with some detergents to fight against greasy seals and stains. Most products contain surfactants (mild detergent), water, mild aroma for deodorization, anti-bacterial material and synthetic resin dispersion, in order to minimize repeated contamination. Although this powder belongs to the ‘dry’ category, it feels wet. Synthetic polymers or surfactants work as dusters which wipe carpet fibers and absorb the dirt. There are several warm-water carpet cleaning machines which are mobile, wheeled and container-shaped. They have a bucket (for detergent water), combined intubation tubes for spraying detergent solution and for the pump (vacuum) machine. With that, they absorb the mixture of water, dirt and detergent from the carpet. Carpet surfaces are normally worth cleaning at least once a year, but it may depend on usage and demands. Do dust mites disappear from the textile after carpet cleaning? If cleaned thoroughly, they do. However, dust mites can easily return to places where people spend a lot of time. They feed on epithelial cells which naturally accumulate within ones home. No need to worry, because regular cleanings can solve this issue. Can I perform stain removal on my own? Yes, of course, but you might not manage to remove the stain or the detergent from the textile. It may also fade the colours and increase the aging process, thus leading to tears. Furthermore, because the detergent is not wiped out properly and as more dust occurs, it can leave a more prominent stain. Dog or cat urine. What to do? Cleaning and odour removal is very difficult. In nature, territorial marks remain and cannot be washed away. In the home, pets will tend to mark in the same spot repeatedly. This requires special cleaning and rinsing which usually gives the required result. As a pets sense of smell is 20 times stronger than ours, it can take time to eradicate their preference for a spot but we can guarantee this odour can be removed from your sense of smell. Here is a tip: If a pet`s stain gets on to your sofa, thoroughly wash it with a wet towel. The towel should not be too wet and a little detergent may be added. Stain removal is the most effective when treated immediately. Dry detergents consist of such synthetic polymers or organic absorbing materials, that are rubberized with some detergents, in order to fight against greasy seals and stains. Most products contain surfactants (mild detergent), water, mild aroma for deodorization, anti-bacterial material and synthetic resin dispersion, in order to minimize further damage. If the carpet is very dirty, repeat the last process.In case of fibrebonded materials, only special powder developed for fibrebonds can be used, otherwise powder removal (hoovering) is tough if not impossible. Although this powder belongs to ‘dry’ category, it feels wet. Synthetic polymers or surfactants work as dusters, which wipe carpet fibers and absorb the dirt. 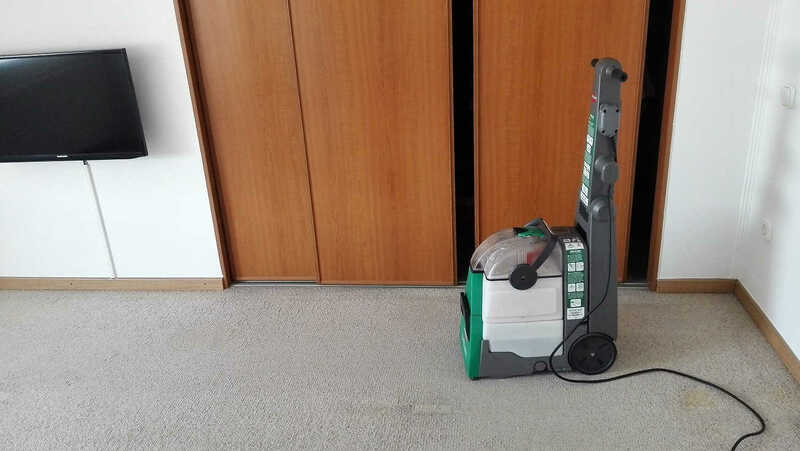 How to perform dry carpet cleaning? Hoover the whole surface thoroughly with a rotating brushed vacuum cleaner. Remove the stains (see stain removal later). Onto the dirtiest areas (traffic routes), spray some stain cleaner material in order to stir up dirt found on high-traffic places. Spray the detergent evenly on the surface of the carpet. The recommended dose may vary depending on the product and the extent of the contamination. Thoroughly work the detergent into the fluff using the cylinder brush machine. This machine has two brushes rotating opposite of each other, that work the detergent into the fluff. Let the powder fully dry (at least half an hour), before you start to remove it using the rotating brushed industrial vacuum cleaner. You want your furniture to look fresh and clean. You have invested money and time into your sofa, love seat, and chairs. More importantly, your furniture creates the first impression your guests see when they enter your home. 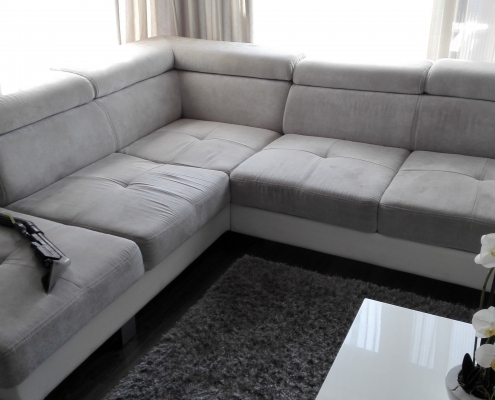 To protect your furniture from becoming dirty, you will want to maintain the fabric with regular cleaning. In addition, a spill on your furniture requires immediate upholstery cleaning to avoid setting stains. While home remedies may work in some cases, professional upholstery cleaning will usually produce the best results. Our carpet cleaning company offers quality upholstery cleaning service. Dirt and dust can collect on the fabric of your upholstery. In addition to making your furniture look unclean, dirt and dust can cause stains if it becomes wet. Be sure to vacuum your upholstery weekly, working in short left to right strokes to prevent dust from settling into the fabric. To get in the cracks and crevices of your furniture, use an upholstery attachment. To get into button tufting and other tight spaces, blast away dust with a can of compressed air. If you have pets, be sure to remove as much hair as possible. A vacuum may not be sufficient for pet hair, and you may need to find an effective pet hair remover designed for upholstery cleaning. Spills are the most common source of upholstery stains. When a spill happens, time is of the essence. You don’t want to let the spill soak into the fabric, furniture stuffing, or wood. Here are a few tips to keep in mind for emergency upholstery cleaning. -First get a white cloth and blot the spill. Never scrub or rub it as this can set the stain. Try to keep the spill from spreading into a larger area. -Next, add a little mild dish soap to water. After testing it on an inconspicuous spot of the fabric, blot the solution onto the spill, using only enough to just cover it. Let the spot dry completely. If the fabric has a high pile, brush the fibers in the correct direction. Tip: If you have spilled grease on your furniture, sprinkle a little cornstarch on the spill and let it sit for 30 minutes. When it has absorbed the oil, vacuum it up. If your upholstery has stains, there are a few steps you can try before a professional upholstering cleaning. -First vacuum the stained area thoroughly to try to fade the stain. -Next check your upholstery’s cleaning instructions to determine whether you can clean with water or must use other cleaners like vinegar or chemical solvents. Many pieces of furniture may not have instructions, especially if they are vintage or antique. In this case, test the cleaner on a hidden spot of fabric. If this sounds too complicated, or you have tried it unsuccessfully, you may prefer to contact our professional carpet cleaning company to handle your upholstery cleaning needs. 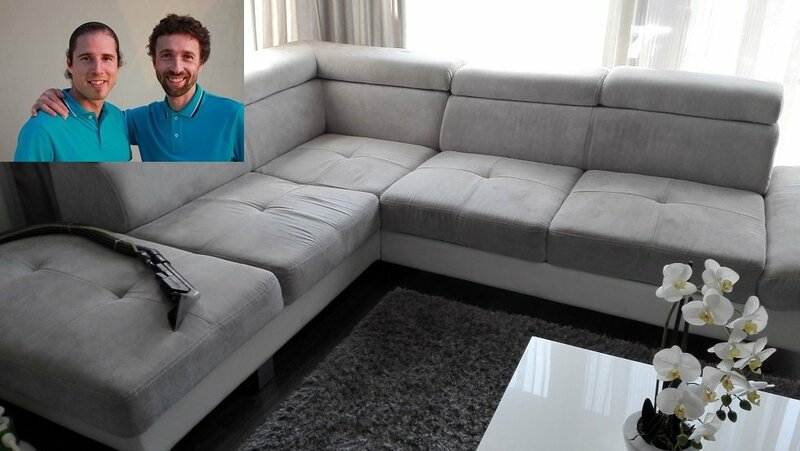 Your furniture is an investment, and a professional upholstery cleaning will give you the best results. While you might save a little money trying to clean stains yourself, there is no substitute for the experience of our quality carpet cleaning service.